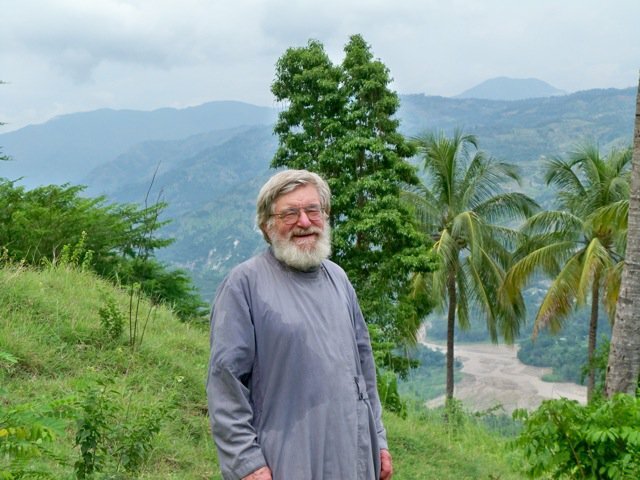 "THE HAITIANS ARE HEADED IN THE RIGHT DIRECTION..."
Deacon Andrei Roudenko in Haiti. - Fr. Andrei, this was your first visit to Haiti. Tell us about your impressions. My visit to Haiti left me with some very deep impressions. This is a lesson for Western man about Orthodoxy, about how it is able to thrive in simple circumstances, although with considerable depth and childlikeness. They all sing together to interesting effect; they sing on the kliros and everyone responds. The effect is a very thorough and deep one. It would be good for seminary graduates to spend some time there, in order to see what Christ’s Cross is like. What Haitians are currently bearing; that is Christ’s Cross. They have been hit by a terrible tragedy, and on the backdrop of that tragedy, they are diligently building their churches and communities. Harboring no doubts, they try to obtain land and have it blessed. This is Orthodoxy in its simplest yet deepest form. - How would you explain the appearance and development specifically of Russian Orthodoxy in Haiti? Russia has always borne Orthodoxy by example rather than by force. These people have caught on to the example of our Diasporan Russian Orthodoxy. They have felt it with their hearts. All of their traditions are similar to our Russian ones. - What is the condition of the clergy? One of the priest’s houses was destroyed – Fr. Jean, while the house of the other – Fr. Gregoire, remained intact, thank God. They offered us their “residence,” a bedroom, while they themselves lived in a tent outside on their property. Fr. Gregoire has two small bedrooms, a living room, and a veranda – everything is open, as there is no winter here. Everything is small, but comfortable and pleasant. In greeting the hierarch, they tried hard, of course, and greeted him well. However, one cannot easily gauge their situation by this. I don’t know how well they are doing in reality. Currently, the Fund for Assistance has provided both priests with automobiles, which they absolutely need, because they need to travel from parish to parish, and the roads there are in terrible condition. Not far from Fr. Gregoire’s house is a school for mentally handicapped children. They sang for Bishop Michael. They are very affectionate children; they would come up to us and hug us. It was very moving. - What were your impressions of the moral condition of the mission members? Judging by how they pray to God, they are headed in the right direction. They are trying to touch up their churches. But the situation is complicated; it is still difficult to travel the narrow streets, and there is rubble everywhere: concrete, sand, etc. But one can feel progress in the developing mission. I was very touched and struck by the fact that, when they are in church, they forget all of their sorrows. This saves them – they feel the presence of God. I think that their priests help them a great deal. In the most literal sense, they cluck over them like brooding hens, going and watching over them, caring for them. It leaves an excellent impression. They literally treat their flock as their own children, in the best kind of way. They are always smiling, always treating their flock very well, and their interaction is plain. There is no formality, no primness; they are simply like a father with his children. Parishioners, meanwhile, run after their pastors as chicks after hens. When they part ways, they wave for a long time; it’s wonderful and touching. The Haitians are quietly bearing their labors, despite everything. It is difficult to get even basic needs, such as water. But they always have a good attitude, which really recharges our batteries. Not only while we were there, but even now this feeling remains. "Mission members are relying on Orthodox support..." - an interview with priest Matthew Williams.